The University of Illinois’ business school in Urbana-Champaign was originally approved in 1914, then titled as the College of Commerce and Business Administration, and opened in the spring of 1915. The school originally had three departments; in economics, transportation, and business organization. Nearly one hundred years later, in 2003, the school was renamed College of Business. Then, in late 2017, College of Business alumni Larry and Beth Gies donated $150 million to the school, upon which its name was changed once again to the Gies College of Business. The Gies College of Business operates two campuses, with the main headquarters located in Urbana-Champaign, and the other located at 200 S. Wacker Ave in the heart of the Chicago metro—right near the famed Willis Tower (formerly known as the Sears Tower), the tallest building in the city and second tallest skyscraper in the United States. The center of the business school campus, known as the Business Quad, is located in the heart of the University of Illinois’ Champaign campus, which is about 140 miles south of Chicago. The Urbana-Champaign campus is less than 10 miles from the University of Illinois Willard Airport. The Gies College of Business’ campus in Urbana-Champaign is made up of four buildings which, together, complete the Business Quad in the southern portion of the University of Illinois campus. The Quad is made up of the recently finished Business Instructional Facility, David Kinley Hall, Wohlers Hall, and the Survey Building. The Business Instructional Facility, originally approved in mid-2004, is a 153,900 sq. 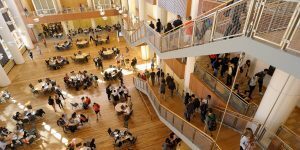 ft., $62 million building that features the school’s MBA and Accounting programs, as well as its Undergraduate Affairs program. The school’s Chicago campus offers its Executive MBA and an M.S. in Taxation. The University of Illinois Gies College of Business employs 98 tenured faculty members, 55 additional instructors, and 43 named faculty, which includes endowed chairs, faculty fellows, and professorships. There are currently 3,140 total undergraduate and students enrolled in the Gies College of Business, and 3,073 graduate students. Of which, 238 are enrolled in the school’s MBA programs. The Gies College of Business offers a traditional MBA, an Evening MBA for working professionals, and an online iMBA. The school also provides a Masters of Science in Business Administration, as well as many additional masters of science programs with a business focus, such as the Masters of Science in Management, Finance, and more.